Ladies and gentlemen. Forgive me if I am somewhat nervous. I come, as you know from the colonies! We are not used to being in the presence of such an august gathering. I grew up in the Eastern Cape, an area of South Africa much like the one so well described to you by Thomas Hardy. It was a world of oral tradition, healing properties were herbal, an abscess would be treated with poultices, clean water was simply not available. Gastro intestinal infections, malaria, cholera were rampant. Life was brutish and short. Electricity and the horseless carriage did not exist for me. The hardness and poverty of existence was aggravated by an uncaring society. Colonies were meant to be exploited both for the mother country and for those who came to settle in our area. Fresh in the memories of the older generation of the poorest of the very poor, and spoken of in low hushed tones, what was said to be a hugely profitable business that was said to have been abolished – that was the business of slavery. My youth and young adulthood was spent with others in fighting an unjust and oppressive system. Many African leaders today would say exactly the same thing. And when you assess the achievements and failures of Africa you must always keep this background in mind. One of the greatest mistakes which is made by serious political commentators today is to judge us on the same basis by which you judge opinion makers in the old and advanced industrial countries, forgetting that for more than three centuries our people were denied the privileges which you take for granted. You went to the best schools in the country – well equipped with highly qualified educators; classrooms properly equipped with learning aids; where the language at school was identical to the language at home; with parents with a high level of educational accomplishment, who could help their children to grasp sophisticated concepts at an early age. But when you consider the situation of the blacks in Africa you come across a different state of affairs. Children who go to school without any learning aids. Taught in a language which is not theirs, by teachers often not so very qualified. A child comes back from school normally to parents who have no educational background at all. Poor children eating porridge in the morning, porridge at lunch, porridge as their dinner, unable to concentrate. Large families with little room to move about. A child who shares a room with about three or four others. No table, no chairs. Doing their homework on the floor. These are the people who live in Africa today and I hope that when you make your assessment you will bear in mind this background. The people who run the governments in Africa today are people who were never given any opportunity to train in government, as many of you are. And I have no doubt that you will bear this in mind, not only in our discussions here but when examining the whole situation in Africa. Being a former head of state has its advantages. One of them is having the time to speak in institutions where young people must listen while their elders pose difficult questions. I trust that my honorary membership of the student unions of a number of London University colleges, including LSE, will not mean that I have to try and provide answers myself! Nor that I will be examined on what I say. One shares one’s thoughts with every confidence at a university with a proud record of solidarity with the struggles of oppressed people, and which is also renowned world-wide, as a centre of learning and enquiry. LSE, as part of the University of London, was in the vanguard of the great army of men and women across the world who responded to the call to isolate the apartheid regime. They insisted that human rights are the rights of all people everywhere. I feel greatly honoured to have an honorary degree from the University of London. Today brings an opportunity to thank LSE in person and with all humility for the part it played in that tribute to the South African people for their achievement in turning from conflict to the peaceful pursuit of a better life for all. For many South Africans, LSE also meant the opportunity for learning that apartheid denied them in their own country. Those who were students are now working in all sectors of our society, leaders of a nation, leading a bright and common future. We continue to draw upon you for training and knowledge in fields that are critical to the development of our country. May your practical solidarity and our partnership long continue. Your invitation to me to reflect with you on the challenges facing Africa speaks of your continuing commitment to our shared goals and I thank you most sincerely. A difficult question I wish to pose today is simply this: What historical stage is Africa going through? As is generally the case with questions of history and development, an adequate answer will require years of work by African historians and social scientists in partnership with institutions like yours. This is especially so, given the rapid and far-reaching changes affecting the world as a whole. And it is quite likely that future historians will not see this period in quite the same way as we who are living through it. So I will exercise that privilege I refer to, and not try to answer the question, other than to say this: we are convinced that we are in a period of decisive historical significance for Africa and its place in the world. We are determined that this 21st century shall indeed be the African century. Matching the scale of what we are seeking to bring about, our challenges are formulated in terms that may evoke periods of major historical change in other regions of the world in other times. Thus, the idea of an African renaissance has taken hold in our continent with all the resonance of an idea whose time has come. The rebirth we are engaged in is not one that will culminate, as European renaissance did, in colonisation and dominance of a world economic system, of which the slave trade was an integral part. Ours is, however, a rebirth that must deal with problems that derive from Africa’s historical relation with the rest of the world, established in that period. And this must be achieved in a rapidly globalising world. A second historical project, related to the first, is that of building strong institutions in a united continent. Political, economic and social institutions at national, regional and continental level. The weak states that are also part of our historical legacy are amongst the conditions which all too easily allow war lordism to emerge, ethnic mobilisation to divide a united people into warring forces, and the resulting tensions and conflicts to threaten regions with instability. Again, this process of building strong states and institutions cannot pass through the horrific destruction and slaughter that Europe inflicted upon itself before it achieved that goal, above all in the first half of the 20th century. On the other hand, the system of multilateral and international institutions, that were established in the middle of the 20th century to ensure that such catastrophes do not happen again will provide an important part of the armoury of weapons for building an equitable world. This remains true, even as we seek to reform our international organisations so that they reflect in practise the democratic principles of a de-colonised world. The vision expressed in the idea of African renaissance is that of the reconstruction and development of an Africa in which people’s lives are constantly and rapidly improving towards standards broadly in line with the best in the world. It is also a vision of an Africa that is integrated in the world on an equal basis. Africa collectively stands at the bottom of the world stage of development – completely. This means for millions the ills brought by poverty and under-development, the scourges of disease such as malaria, tuberculosis and HIV Aids, and educational programmes that are far from what is needed for Africa’s full participation in the modern economy and society. As the world is seeing now in what the floods are doing to the people of Mozambique and part of South Africa, it means a vulnerability to environmental disaster. If, despite all this, we talk with conviction of realising our long-cherished dream, of rebirth and reconstruction it is because the conditions for doing so now exist. They include the stage of development of the world’s economy. While this brings the danger that historical imbalances may be entrenched and even worsened, it also brings opportunities for Africa as a region of vast untapped potential. The conditions improved at the liberation of South Africa as the culmination of Africa’s struggle against colonial and white minority rule. This brought a new possibility for the continent to focus energies and resources on shaping its own development, rather than having to devote them to resistance to colonial and racial oppression. And the conditions for the regeneration of Africa include the growing mass movement of Africans during the past two decades, manifested in struggles against dictatorships and undemocratic rule. Part of this process, and in turn giving it impetus, is the emergence of a new generation of African leaders, capable men and women who are not prepared to accept as inevitable the current conditions under which the ordinary African lives. It is for such reasons that we are hopeful for the future. This is not to gloss over our problems, or to underestimate the scale of what is required. Nor is it to ignore the fact that some of our problems are of our own making as we know from the record of the first decades of independence. The achievement of our vision requires rapid industrialisation, that exploits our scarcely tapped resources and our strategic geographical location. In turn, that requires massive programmes for infrastructural development for the regeneration of our cities, and for the education of our people. In our interdependent modern world what happens in one country impacts on many others. What happens in Africa impacts on its relations with the world. Sustainable growth and development therefore requires peace, security and stability. And they require the unity of the African continent. Peace is the greatest weapon for development. Conversely, conflicts and tensions that undermine stability and security can set back the progress that we have started to make on the path of development. What gives hope is that Africa’s leaders are finding creative ways of addressing the resolution of conflicts. We do believe that South Africa’s transition, hailed by many as a miracle, though in reality it was based on the actions of humans, has had a great importance in demonstrating what is possible when the will and the conditions for peace are there. What is always difficult in life is not so much that we influence and change others, the most difficult question is to change yourself in accordance with the conditions that you confront. And as I have pointed out before, one of the most difficult questions which faced those in jail, those in exile, and those that work on the ground, was to reconcile our emotions with our thinking. Our feeling was that under no circumstances shall we sit down with the apartheid regime who have subjected us for centuries to some of the most painful experiences you can think of. For that reason, it was unthinkable for us to sit down with our enemies and talk. But our brains said if you don’t sit down with these people, your country will go up in smoke, and innocent civilians will be slaughtered. The infrastructure of the country will be destroyed. Community development will come to an end. And the problem was to reconcile these two – your feelings and your thinking. We faced problems among our own comrades and colleagues, we faced problems with the enemy that had continued to say for decades ‘we will never negotiate with terrorists.’ And we had to find a way so that they could cross a bridge without humiliation. It was through the ability to reconcile these two contradictions that we were able to bring about a peaceful transformation in our country and to confound the prophets of doom who predicted that there would never be a peaceful change in our country, that any attempt to bring about changes would engulf South Africa in rivers of blood. We were able to prove them wrong because we were able to change ourselves, first and foremost. And anybody who wants to have an impact on society must start from himself or herself. Though South Africa has responded whenever requested to assist in the resolution of conflict it is always on the basis that only the participants in the conflict can themselves achieve lasting solutions. I have come from the latest meeting in Arusha [Tanzania] confident that we are on the verge of a breakthrough and that the process will indeed bring lasting peace to Burundi and her people. Now when I went to Burundi I hardly knew what I know now. I was not aware of the calibre of the leadership of that country. But I was tremendously impressed that out of the 18 political parties you had six graduates in engineering, trained in Brussels, Paris, Germany, and Russia; that you had four graduates in law; two medical doctors; one graduate in mathematics; a graduate in economics; a graduate in French literature; a graduate in biology; a graduate in sociology. That is the calibre of the leadership that we are dealing with. And it was for that reason that, right from the start, I believed for certain that sooner or later we will have a breakthrough. Burundians that are more important than whatever differences divide them. Amongst those common principles is that it is totally intolerable that innocent men, women and children, the disabled, should suffer loss of freedom and even be slaughtered because leaders cannot make the compromises required for peace. The way in which this principle has so often been violated in human history is a tragic indictment of political leadership. What underpins one’s hope for Africa’s future is the way in which the peace process in Burundi has been promoted by the joint efforts of leaders from many African countries, and with the active support of the international community. Together, in consultation with and under the guidance of the Organisation of African Unity, they have been exercising collective responsibility for African peace and security. The international support that has been vital for the peace process will continue to be important in the reconstruction of Burundi that peace will make possible. Such is the path towards reconstruction and development of Africa. Leaders who do not put the interests of their people above their own, cannot achieve lasting peace and therefore sustainable development. No country in Africa can solve its problem on its own. Nor can Africa achieve her goals on her own. Ambitious programmes of economic reconstruction, insuring peace, stability and security, and dealing with problems deriving from the historical relations of Africa with the rest of the world, requires a pooling of sovereignty, removing the burden of external debt and negotiating equitable trade regimes and systems of investment – requires a collective African voice that reflects a popular conviction that the continent is indeed on the path towards a rapidly improving life for all its people. And that Africa is indeed returning from the margins to the mainstream of world history. That is why we include amongst our priorities the building of co-operation with the rest of the South in partnership with the industrialised countries of the North. That is why we lay stress on the development of our regional and continental organisations, and the progress towards economic integration. That is why the entrenchment of democracy is fundamental to our future. Africa’s position in the world today will depend on what Africa does to and with itself. In the end that is why we do remain confident in our determination that we are at the dawn of the African century. I hope observers from Europe have not lost sight of what is happening in Africa, something which is exemplary for many parts of the world. It is common knowledge that some years back General Obasanjo of Nigeria staged a coup in his country because of reasons which he explained, which in many respects were convincing. But he made an announcement when he staged that coup, that within three years he would hand over power to a civilian authority. He did that. Then there is the case of General Abubakar also in Nigeria. When Sani Abacha died, General Abubakar took over as head of the military government. At the same time he made a statement, that as soon as he had normalised the situation he would hand over to civilian rule. Both soldiers honoured their commitment. Today General Obasanjo is the President of Nigeria through the ballot box, he is now chairman of the 77 Group of Nations which will be meeting shortly in Havana in Cuba. General Abubakar – I invited him to the summit of the Non-Aligned Movement because of his declaration that he would hand over to the civilian authority. He was warmly welcomed by delegates from all over the world because of the example he had set. 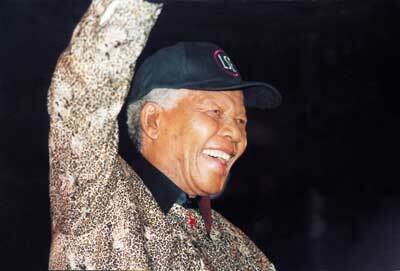 And he was given the honour, at one stage, of chairing the proceedings of the Non-Aligned Movement. Then you have heard of the case of Nyerere. He knew exactly when to step down. He stepped down at the height of his power and popularity and made way for younger people. President Masire of Botswana has done exactly the same thing. At the height of his popularity he stepped down and made way for younger blood. These things are happening in a continent which is regarded as still living in the dark ages. I want you to open your eyes and to observe what is going on in that continent. Almost every country, with a few exceptions, has now democratised, and these are developments which give us hope that, whatever problems we have – and we have many and some of them are very serious -we nonetheless have men and women who are highly gifted and capable of rising to the challenges that face the continent. You will again excuse me ending up by telling a story, which I have told several times. A young lady of five came to my gate in my house, and security said ‘Look, there is a young lady here outside who wants to see you.’ I said ‘Let her in.’ They said ‘Mr President, she is very cheeky.’ I said ‘Precisely for that, let her come in.’ And indeed, she was quite a lady. I was sitting in my lounge. She just stormed in, without knocking, and the first question she asked was ‘How old are you?’ I said ‘Well, I am very sorry, I can’t remember. But I was born long, long ago.’ She said ‘Two years ago?’ I said ‘No, much longer than that.’ Then she changed the subject. ‘Why did you go to jail?’ I said ‘I didn’t go to jail because I liked. Some people forced me to go there.’ ‘Who?’ ‘People who don’t like me.’ ‘How long did you stay there?’ I said ‘I can’t remember but it was a very, very long time.’ Again the question of two years came in. And when I couldn’t answer her question, she said ‘You must be a very stupid old man!’ And having said that, she continued talking to me as if she had paid me a compliment. Ladies and gentlemen, I tell this story so that if you feel that I have not risen to expectations, please be a little more diplomatic than that young lady! Mr Mandela, may I first say what a sincere privilege it is to have you with us at LSE today. My question is, you have been such an inspiration to so many people around the world, I was wondering who has been an inspiration to you? Well, that question has been put to me on several occasions. Very often one says the inspiration was either a mother or father. Unfortunately, as I have indicated in the opening comments I made, I grew up in an area where education for blacks was very rare indeed. And my parents had never been to school. They were completely illiterate. My inspiration are men and women who have emerged throughout the globe, and who have chosen the world as the theatre of their operations and who fight socio-economic conditions which do not help towards the advancement of humanity wherever that occurs. Men and women who fight the suppression of the human voice, who fight disease, illiteracy, ignorance, poverty and hunger. Some are known, others are not. Those are the people who have inspired me, and indeed many of you here as well. My question to you is, through all your experiences, what has been your survival technique? He will tell you that on numerous occasions I came with an idea, and they overruled me. And I had to accept that. And there is a story I normally tell to show how ordinary I am and how wrong I can be. I made a suggestion to the national executive of the ANC that said the vote in our country, the voting age must be reduced to 14. And I pointed out that in seven different countries in the world, the voting age had been reduced to 14 because in those countries you had young people who never experienced childhood, who went out at 10, 11, 12 to go and fight for the liberation of their country. They did so and liberated their country. And the authorities said that because of the contribution of these children they must be given the right to determine jointly with the rest of the population the affairs of their country. I came along with this suggestion. I did not expect such opposition as I got, from almost everybody. I was alone, and I had to withdraw. But to complete the rejection of my scheme, one of the influential newspapers in South Africa had a cartoon where they showed me with a baby with napkins, putting a ballot paper in the ballot box. I realised I was totally wrong! Now that is the picture I would like you to have – that none of us, and least of all me, has the ability, the skills, to answer your question. But if I had my colleagues with me, it would be easy for me to do so. This post originally appeared on the Africa at LSE blog.